We went for the record today on how much you can cram into one day. Following our Continental Breakfast (Thanks, Victor), we begin our second day of hiking. Thankfully the Swiss place benches along the trail to mark a good place to rest for those of us who are gasping for air. I stay behind about a third of the way through the hike and the others walk on to Sprutz Waterfall and Bryndle. They hike behind the waterfall and to the top of the mountain. Meanwhile, I am sitting on one of these benches---soaking in the glory. They soak in the "cold tub" when arriving back--refuel and get ready for our next big adventure. We all-except for Jim who has hiked on- ride back up to Mureen on the cable car and meet our guides who lead us --ONCE AGAIN---up the mountain trail. Where we prepare for lift off. Babs seems to be carefully supervising the process. Who could blame her? We are about to place our lives in the hands of complete strangers! All you have to do is harness up, run, and jump off the side of the mountain---NOTHING TO IT! Mountain goats, avalanches, base jumpers, eagles, rainbows in waterfalls, breath-taking views---OH MY GOODNESS---the highlight of the entire trip! 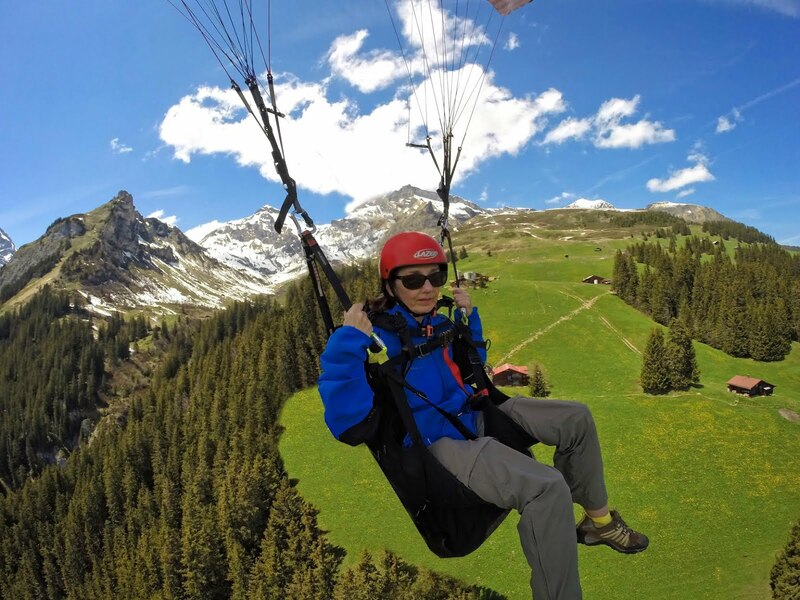 We sail around for 20 + minutes and gracefully land in the valley town of Lauterbrunnen. No time to waste---we head BACK UP the mountains--four cable car rides later--we are at Schilthorn---famous for the James Bond movie. AND BABS HAS A NEW BEST FRIEND! 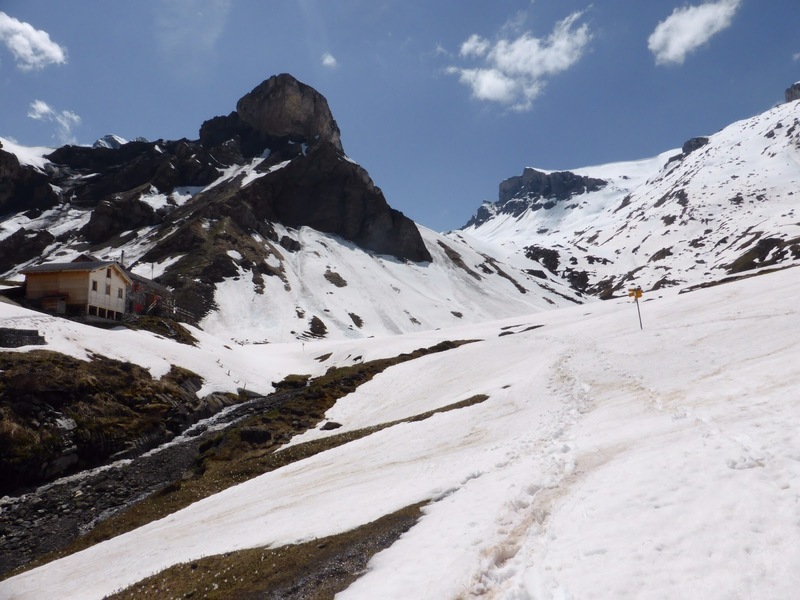 Mureen and Gimmelwald are in white --the bottom third of the picture--our destination is at the top. WHAT A DAY! And HERE is the proof--I DID IT! If I trusted this complete stranger for a wonderful experience and to keep me safe, why would I not also trust God with all my being---for I know Him--and how He loves me. Lulu, you're unbelievable. You actually flew down the mountain in a parachute type thing? That's very brave indeed. How could you? I wouldn't do that if you paid me. I admire your courage but would certainly not copy it. I can't stand heights and I suffer from vertigo when I put my socks on. (Must wash them more often). I remember years ago I had an adventure of sorts with strangers. Some friends and I climbed Mount Snowden in Wales. I was hesitant going up with them but they assured me it would be OK. Half way up it started to rain heavily and we all sheltered behind a big rock for about half-an-hour. I was freezing and wanted to go down again; but they wanted to continue up and were reluctant to let me go down alone. Fortunately, minutes later it started clearing up and a German tourist couple, husband and wife, came down the mountain. It was agreed that I would follow them down to safety. They marched ahead talking loudly to each other and I followed like a faithful dog a few paces behind. After a while they separated; the man going one way and the woman another. I had to decide quickly who to follow. The woman walked slower and would be easier for me to follow down the somewhat dangerous mountain. On the other hand, better follow the man just in case he got the wrong idea about me following his wife. I followed him a while then he stopped against a tree to have a pee. When he heard me behind him he turned round and said a few things in his native language. I doubt he was complimetary judging by his tone of voice. I'm enjoying your trip through Europe. Thanx. Anytime someone heads for the bushes alone, it is best to let them go! Laughing, Victor! I wanted to see as much as possible, Linda. Trip of a lifetime! Occasionally I leave good judgement behind, My Friend! Just catching up on "the tour": What an incredibly, amazing experience!! Yes, my trip of a lifetime!